When I’m needing to carb-load for a running race I always turn to pasta. Now, when I say “carbo-load” whose mind goes straight to Michael Scott shoving fettucini alfredo into his mouth minutes before the Dunder Mifflin 5k? This is a practice I do not advise, but I’m hoping you already figured that one out for yourself. If you do find yourself training for a long distance running or sporting event, I recommend increasing your carbohydrate intake for the few days prior to race day. Our muscles can hold large stores of glycogen (the storage form of carbohydrates), which will get broken down into glucose (a fast energy source) for your muscles to use for your event, and so we want those reserves nice and full. Carbohydrate sources that I recommend would be pasta, bread, potatoes, and fruits and vegetables. So, with the Newport Liberty Half Marathon days away, I pulled together a four veggie pasta salad to enjoy for lunch during the week. I used a mixture of Banza, a chickpea based pasta, and regular white flour pasta for this dish, but feel free to use all white or whole wheat pasta if you prefer. 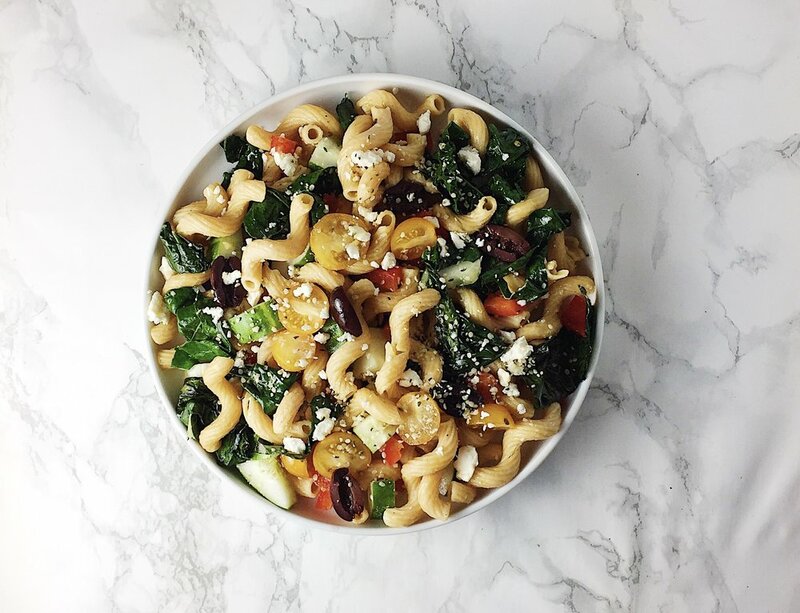 The thing I love about pasta salads is that the add-ins are really up to you! I usually like to pick a “theme” and base my vegetables and other bits by this idea. 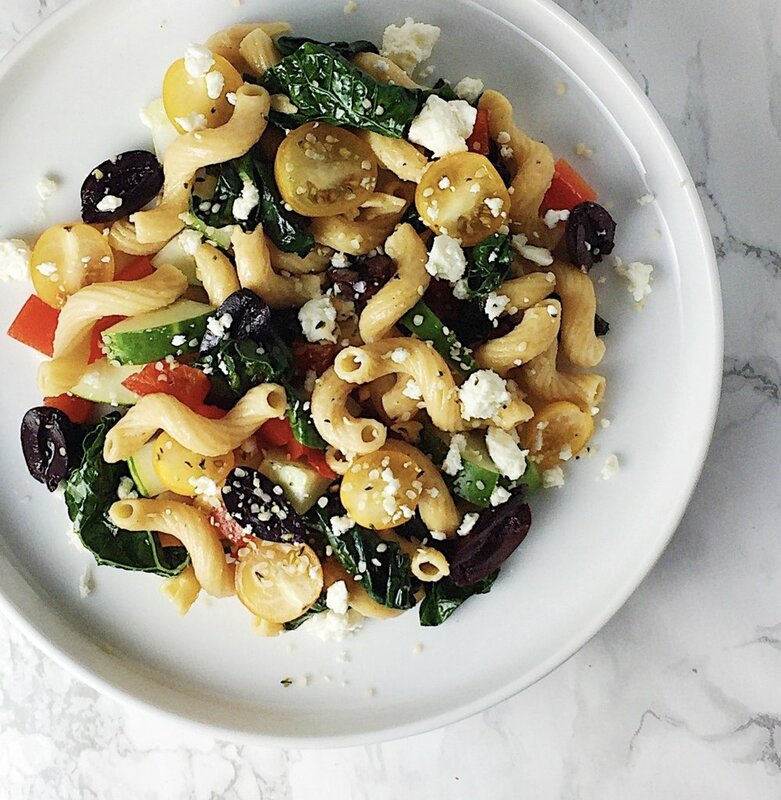 For this recipe I was feeling Mediterranean and created a Greek-style dish that used up some summer produce from my fridge. Cook pasta according to instructions until al dente. Drain and reserve. Into a large mixing bowl, add chopped cucumber, diced bell pepper, halved tomatoes, and olives. Once pasta is cooled, add to bowl. In a heated saute pan, add about 1 tablespoon olive oil. Add prepared kale and crushed red pepper to pan and saute until kale becomes soft. Immediately transfer cooked kale to pasta and veggie mixture while warm, mix well. To pasta mixture, add lemon juice and 2 teaspoons more of olive oil. Mix everything until well combined. To serve, top with 1 tablespoon of hemp seeds and desired amount of crumbled feta cheese.